HyFlex courses are characterised by a mixture of online and face-to-face learning components. In particular, students are allowed to choose to complete any part of the course in online and/or face-to-face mode. Such courses arguably provide the highest flexibility for student learning, but also pose a number of challenges to learning design. These include not only the ones inherent to online instruction and face-to-face instruction but also those of creating equitable alignment between the two modes to achieve the same learning outcomes. In this chapter, we report on the insights drawn from designing and delivering a second-year undergraduate information technology course on two campuses, in which students could complete any learning activity and assessment online or face-to-face. We describe our approach to support student engagement, group work and a peer review in HyFlex mode, and some challenges we faced to match learning designs to available technology. We evaluated our teaching components according to student participation and their quantitative and qualitative feedback. We found that most students appreciated the HyFlex mode delivery and while our approach was shown to be effective, it was in some way constrained by the technology available. We would like to thank David Green, Christopher Allan, and Julie Crough for their support with the teaching technologies and innovations used in this project. Australian Department of Education and Training. (2017). Completion rates of higher education students: Cohort analysis, 2005–2014. Retrieved November 12, 2018, from https://docs.education.gov.au/documents/completion-rates-higher-education-students-cohort-analysis-2005-2014. Devlin, M. (2013). eLearning vision. Retrieved from http://federation.edu.au/__data/assets/pdf_file/0020/159122/FedUni_eVision2014.pdf. Griffith University. (2013). Practice standards for online learning at Griffith University. 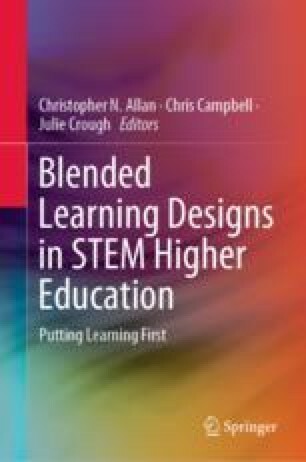 Retrieved November 18, 2018, from https://www.griffith.edu.au/learning-teaching/teaching-and-learning/technology-engaged-learning/getting-started/considerations. Joyes, G., Gray, L., & Hartnell-Young, E. (2010). Effective practice with e-Portfolios: How can the UK experience inform implementation? Australasian Journal of Educational Technology, 26(1). https://doi.org/10.14742/ajet.1099. Parsell, M. (2014). Standards for Online Education. Retrieved November 23, 2018, from http://altf.org/wp-content/uploads/2016/08/Parsell_M_NTF_-report_2014.pdf. Stone, C. (2017). Opportunity through online learning: Improving student access, participation and success in higher education. Retrieved November 23, 2018, from https://www.ncsehe.edu.au/publications/opportunity-online-learning-improving-student-access-participation-success-higher-education/.